We reported a few minutes ago on the gold & silver raid in progress. The cartel raids have now smashed gold over $82 from $1788 to $1706, and silver close to $4 (10%!!) from $37.62 to $33.68. Also notice the classic mini-parabolic moves to the upside immediately prior to the raid- absolutely CLASSIC CARTEL ACTION! The raid began at exactly at 10:00am EST coinciding with the Fed's release of its monetary policy statement to the House Financial Services Committee. NetDania, while a spot chart- obtains their volumes from futures volumes, and displays the smash visibly the best. BrotherJohnF just published a NetDania screen shot demonstrating a volume of over 20,000 contracts, or 225 MILLION OUNCES of paper silver sold over 30 minutes. 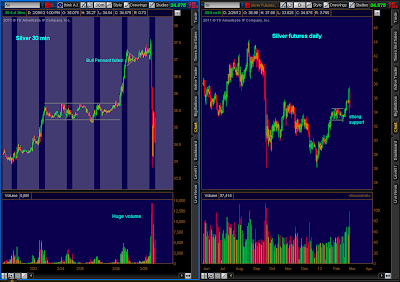 As mentioned above, notice the mini-parabolic up-move in silver immediately prior to massive raid to draw in new suckers (longs) to add firepower to the smash as they are forced to puke their positions moments later as stop-losses are taken out. Now we know why the cartel stepped back and allowed gold and silver to run higher through significant resistance points over the past 3 days- they have been waiting to coincide their smash with the release of the Fed's policy statement, in a weak attempt to use the Fed statement as cover for their massive raid and paper manipulation of the gold and silver market.